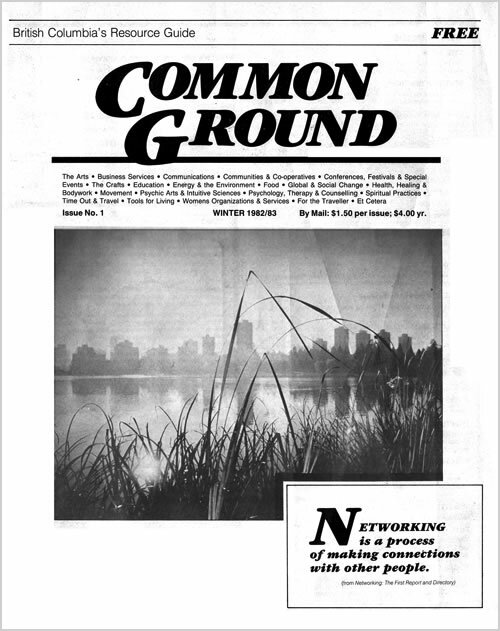 Common Ground is an independent publication, 100% Canadian owned. It is Western Canada’s biggest and best-loved monthly magazine dedicated to health, wellness, ecology and personal growth. 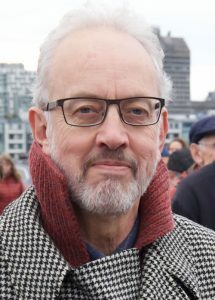 Common Ground’s Publisher and Senior Editor, Joseph Roberts, organized Vancouver’s first Walk for Peace and helped start Common Ground magazine in 1982. They have been making important things happen ever since – always in a socially and environmentally responsible manner – educating and inspiring readers to create a better world. Witness the successful preservation of the Stoltmann Wilderness, Clayoquot Sound, Stein Valley, Meares Island and Burns Bog, along with support of the Nisga’a treaty, midwifery and naturopathic medicine. Common Ground sounded early alarms about mad cow disease, fish farms and electromagnetic fields. The covers of the magazine spotlight local artists and photographers, while its monthly directory is BC’s biggest listing of local health and personal growth practitioners. In 2017 Common Ground celebrated its 35th anniversary year. The year 1982 was huge for me. Against the backdrop of the escalating nuclear arms race, I found myself co-ordinating 170 different groups in Vancouver’s 1st Walk For Peace. Around 35,000 people walked that year, then 65,000 in 1983, and by 1984 100,000 had joined together. It was magnificent, history to be proud of. Common Ground was born out of the spirit of these times. People had a need to connect with other people, to achieve something greater than they could by themselves. I believed anything was possible. Ethics commissioners are hammering politicians. Multinationals, with their government friends in Canada and USA, are squirming about corporate crime wondering where their morals went. Meanwhile civil society in Vancouver just celebrated the 9th Annual Ethics in Action Awards where corporate social responsibility is honoured. Many large and small companies were nominated with six final award recipients: Capers, Little Sister’s Books, New Society Publishers, Small Potatoes, Thrifty Foods, and Whistler/ Blackcomb Mountain Resorts. Common Ground shared in their joy remembering when we received the Ethics in Action Award in 2001 for Ongoing Social Responsibility In Business. Community arts and culture have bloomed in the last twenty years. Vancouver’s International Film Festival, then in its second year, the Folk Festival, Sweet Basil Jazz, Vancouver International Jazz and Writers & Readers festivals have gone from strength to strength. So, too, have the Public Dream Society’s outdoor community events with the brilliant fiery Illuminares Lantern Procession (midsummer night’s fantasy world at Trout Lake) and their Parade of Lost Souls (a Halloweenish night at Commercial Drive), since the society’s formation in 1985. Ravi Shankar, now 82, blessed us with his masterful ragas in the Orpheum thanks to Caravan World Rhythms. With so much going on we are launching a new Arts & Entertainment Section in Common Ground this month to compliment our Events Calendar Datebook. Enjoy. Last summer people from 140 countries converged on Victoria for the 14th Organic World Congress. Hosted by The International Federation of Organic Agriculture Movements (IFOAM) with a theme of “Cultivating Communities”, the conference looked beyond organics to fair, just, sustainable agriculture to grow a better future (see Common Ground’s Organic Earth First edition, August 2002). Local hero Wendy R. Holm, P.Ag., a contributor to Common Ground, received her second Queen’s Jubilee Medal for the work she is doing with Canada’s farmers and water resources. Wendy’s Cuba Farmer to Farmer Project (see our May 2002 edition) will be profiled in a full-length edition of CBC-TV’s Country Canada airing noon Sunday, November 3rd across Canada. Last month, the Bioneers “Revolution from the Heart of Nature” conference (www.bioneers.org) brought together 3000 visionaries, activists, artists and organizations from around the world under one roof in San Francisco. A short list of the remarkable presenters included Paul Hawkins, Peggy O’Mara, John Todd, Fritjo Capra, Sylvia Earle, Naomi Klein, Aqeela Sherrills, Larry Dossey, Percy Schmeiser, Bogaletch Gebre, Sebatio Salgado. Rebounding from the Bioneers Conference I had the good fortune to see an exuberant one-man play, based on the life and writings of the visionary thinker-inventor-philosopher Buckminster Fuller, at the Project Artaud Theatre in San Francisco’s Mission district. This play opened my heart and mind to the brilliance and incredible life of Bucky. It would be great to have it travel to Broadway, London and, of course, BC. To make it happen go to www.foghouse.com for the play and www.bfi.org for the Buckminster Fuller Institute. “Think of it. We are blessed with technology that would be indescribable to our forefathers. We have the wherewithal, the know-it-all, to feed everybody, clothe everybody, give every human on earth a chance. We know now what we could never have known before – that we now have an option for all humanity to “make it” successfully on this planet in this lifetime. Whether it is to be Utopia or Oblivion will be a touch-and-go relay race right up to the final moment.” Bucky said that in 1980 and it is still our choice today. Galen, a former Common Ground editor, was in Washington, D.C. on October 26 protesting against the lies of war, while supporting human rights and dignity. It is great to see signs of peace and democracy breaking out in America. “Yesterday’s demonstration march was wonderful. Somewhere between 100,000 and 200,000 of us in the streets waving signs and chanting. This is what democracy looks like!” Galen wrote. These are the same questions I asked myself in 1982, so I started Common Ground. Maybe this is how each of us awakens to our deeper purpose and connection to life. Twenty years ago it happened to me. Today there are many, many more of us.